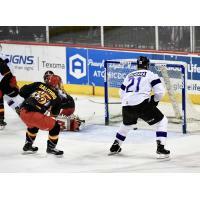 Allen, Texas - The Allen Americans, ECHL affiliate of the Minnesota Wild, lost their third game in a row, dropping a 5-3 decision to the Reading Royals on Saturday night at Allen Event Center. For the second game in a row, the third period was the deciding factor in the hockey game. Reading outscored the Americans 3-1 in the final frame, and outshot Allen 14 to 4. Josh Atkinson scored his first of the season shorthanded to cut the lead to 5-3, but the Royals would go on to win the game and extend the Americans losing streak to three. "It was a repeat of last night," said Americans forward Spencer Asuchak. "We started out slow and then picked up our game in the second period. It was pretty frustrating that we couldn't take that same energy into the third"
With the loss, the Americans are now 16 points behind fourth place Kansas City. The Mavericks shutout Utah on Saturday night 3-0. KC has played six fewer games than the Americans. The Americans and Royals close out their two-game series on Sunday afternoon at 4:05 pm. In the first-ever Allen Americans Alumni Game, Team Red defeated Team White by a score of 10 to 7. Justin Bowers and Tobias Whelan each had two goals for Team White. Daryl Bootland and Jarret Lukin were the winning coaches.